The Long Island Rail Road, often called the LIRR, is a commuter rail system in New York. Its lines travel from Manhattan to Suffolk County on eastern Long Island. Over 334,000 people ride the LIRR every day. It is North America's busiest commuter railroad. It is also one of the few commuter systems in the world that runs 24 hours a day, 7 days a week, 365 days a year. The LIRR was created in 1834. It has never stopped operating since then. In the 1870s it was consolidated with the other railroads on Long Island. It is the oldest U.S. railroad that still has its original name. The LIRR has 124 stations and more than 700 miles (1,100 km) of railroad tracks, The LIRR has a total of 319 miles (513 km) of train routs. It is owned by the Metropolitan Transportation Authority. 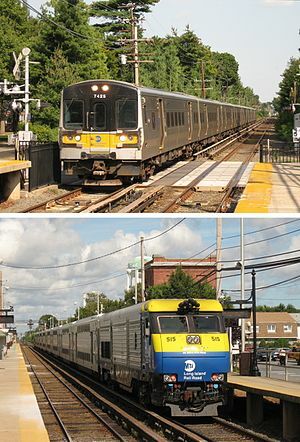 The LIRR is one of two commuter rail systems owned by the MTA. The MTA also runs the Metro-North Railroad to New York's Hudson Valley and to Connecticut. ↑ "The MTA Network". Metropolitan Transportation Authority. Retrieved 10 February 2015. ↑ "LIRR History". Metropolitan Transportation Authority (MTA). Retrieved 2013-03-01. ↑ "Long Island Rail Road - General Information". Metropolitan Transportation Authority (MTA). Retrieved 2014-03-23. ↑ "Comprehensive Annual Financial Report for the Years Ended December 31, 2012 and 2011" (pdf). Metropolitan Transportation Authority (MTA). June 21, 2013. p. 146. Retrieved 2014-08-29. This page was last changed on 17 June 2018, at 00:46.